I've been buying alot of fruit lately, and no one is eating it. I bought a whole watermelon (not a huge one) and if I eat any more I'll be floating down the street! Instead of a fruit salad, I came across this sherbert recipe. It's super easy and no ice cream maker necessary! Place watermelon in a blender container or food processor bowl. Cover and blend until smooth. Repeat with additional watermelon until you have 3 cups of melon puree. In a large mixing bowl, combine watermelon puree, heavy cream, buttermilk, sugar and a few drops of red food coloring (optional). Stir the mixture until sugar is dissolved. Transfer to a 9 x 9 x 2 inch pan. Cover and freeze 2 to 3 hours or until almost firm. Break the frozen watermelon mixture into chunks. Beat with an electric mixer until smooth, but not melted. Cover and freeze until firm. Makes 1-1/4 qts. Note: I preferred this sherbet soft-serve consistency. After it was frozen firm, I micro-waved it for 30 seconds, then beat it again with the mixer and it was smoother and creamier. yum sounds like the perfect summer treat! And no ice cream maker needed... Fabulous summer dessert idea Patti!! I am just plain weird. I feel like I'm the only human on the planet who can't bond with the flavor of watermelon. However, I will eat Jolly Rancher watermelon candies! Go figure. Anyway, my boys adore watermelon. I think I'm going to try making a strawberry-watermelon sherbert, using your recipe. I made a strawberry-watermelon sorbet, and that worked for me With buttermilk and half and half, how can one go wrong?! And this is why you have your own catering company. Because you turn out the good stuff. Love, Love, love this. Oh, and your comment about your son sayong "zalagna" - that just melted my heart!! This looks perfect for summer! 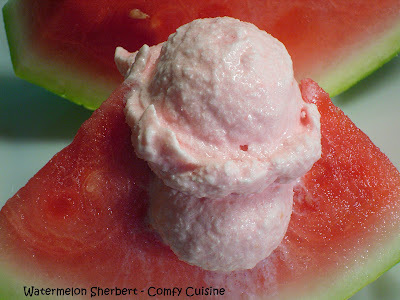 We are featuring your sherbert on our "Fresh Food Friday" blog segment tomorrow! 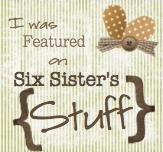 Come check it out and grab a button!